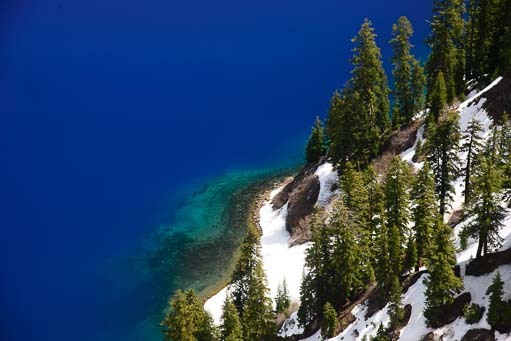 Crater Lake National Park - Bluer than blue! 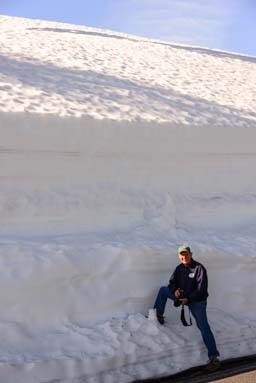 We had seen ankle deep snow in lovely Lamoille Canyon back in Nevada, but this stuff was waist deep! Hey, now it’s over my head! We were so amazed that we hopped out of the truck so I could get a photo of Mark standing next to it. Well, that was nothing! Within a half mile the banks were shoulder high with drifts over his head. How fun!! But that was NOTHING! A mile or so later the snowbank was twice his height. Holy cow!! 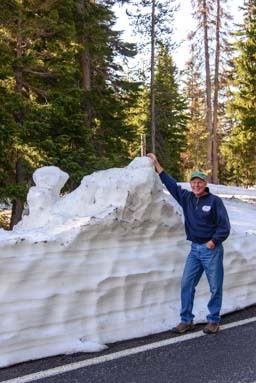 Now THAT is a snowbank!! 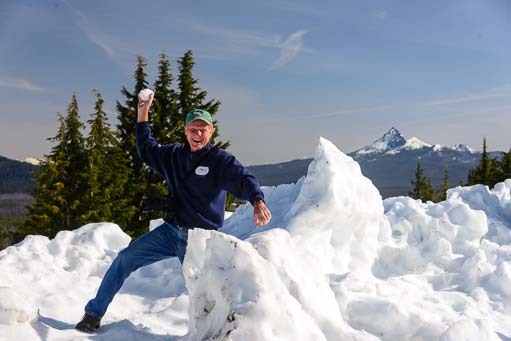 Snow play…on Memorial Day Weekend!! Well, all this wonderful snow brought out the kid in Mark, and before I knew it I was fending off snowballs. Our first glimpse of Crater Lake. Driving further, we suddenly found ourselves in front of the most astonishing view. 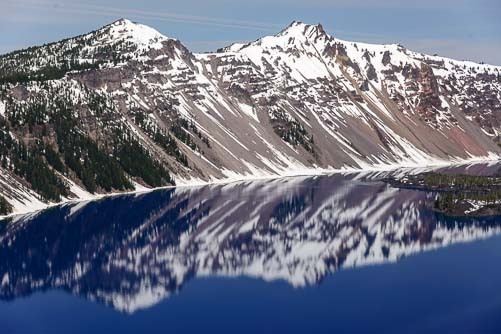 The lake was a vivid royal blue, and the snow-striped mountains sloped down to kiss their reflection in the stained glass surface of the water. Seeing these vibrant hues stretching across the mirror-still water from shore to shore was truly startling. Chatting with some Oregonians who were enjoying the view beside us, we found out that Crater Lake is one of the five snowiest places in the US. A record 75′ 4″ of snow fell in the winter of 1949-50. 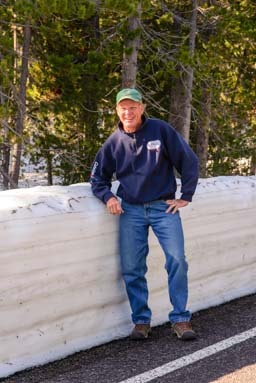 In April, 1983, there was a maximum accumulation depth on the ground of 21 feet of snow. We were shocked that the snow surrounding us now was a paltry 40% of normal. The views on the West Rim Drive are spectacular. 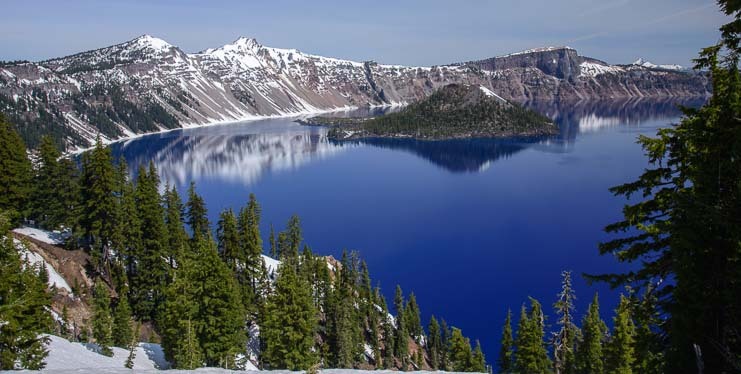 Crater Lake is the most vivid blue we have ever seen. 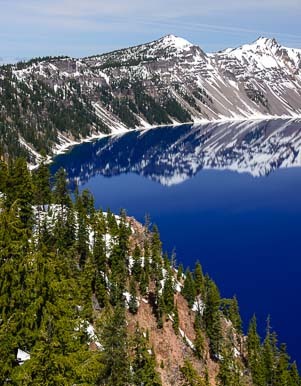 This incredibly clear lake was formed when the 12,000 foot tall Mount Mazama blew its top about 7,700 years ago. Lava from below the mountain spewed out the top, and then the mountain imploded into the “basement” space underneath where the lava had been, creating a massive ditch. Near the shore the water is turquoise. Over the millenia, rain and snow filled the ditch with water, and the pristine four mile by six mile lake was formed. As we wandered around the rim of the lake, taking in the everchanging vistas, the light on the lake got better and better. As the morning progressed, the light made the colors ever more vivid. When we arrived in the early morning, ours was one of just a handful of vehicles in the park, and the light was low and mystical. As the day progressed, more and more people came into the park, and the sun rose higher and higher, turning the slate blue lake into a rich and velvety azure. Near the shore, the water was a bright turquoise. 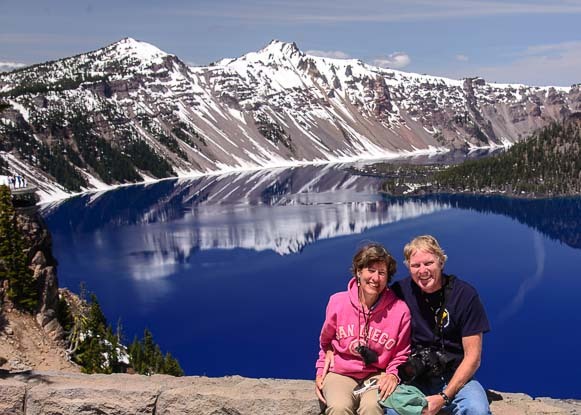 None of the hiking trails were open yet, because they were all covered with snow, so all of us tourists milling around the rim in the crackling warm sunshine contented ourselves with taking selfies and photos of each other for friends at home. We must have been handed a dozen different cameras and smart phones to take photos of strangers that day. Likewise, we handed our cameras to at least a half dozen people to take photos of us! 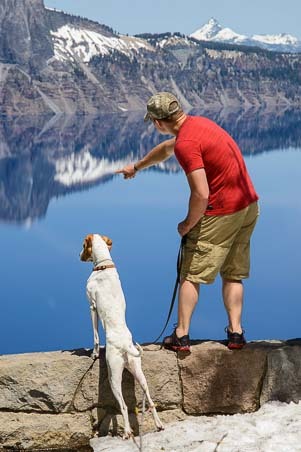 A man in a red shirt hopped up on a rock wall in front of us, and his dog instantly reached his front paws up on the wall and leaned over the edge to have a look at the view beside his master. It was hard to tear ourselves away from the stunning views at the rim. 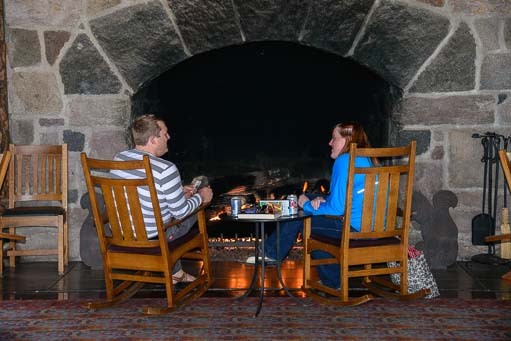 We went into the charming lodge where chilled tourists were congregating in front of a huge stone fireplace and thirsty tourists were drinking microbrews out on the balcony overlooking the view. As I read about the history of the park, I was amused that early visitors disdained the rustic nature of the lodge. Far more fascinating, however, was discovering that thousands of years before these snooty urban guests stayed here, ancient people watched the volcano erupt. Everyone was getting pics of themselves at the rim — us included. How do today’s scientists know this? Because, beneath the ash, archaeologists have found 75 well preserved sandals that were worn by these people! To put this in perspective, Pompeii’s Mt. Vesuvius erupted nearly two thousand years ago in 79 AD, sending hapless Romans scurrying. 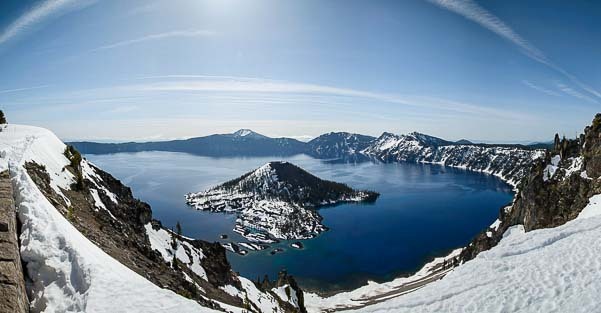 The eruption here at Crater Lake happened 5,700 years before that!! Whoever the ancient people were that were living here back then, they were not running around barefoot. We were as delighted by this beautiful national park as we had ever hoped we would be. But this visit won’t be our last, as we were able to drive only the west rim (the east rim was still closed by snow), and the long list of hikes (also closed by snow) sound truly delightful… Next time!! For now, we couldn’t wait to see more of central Oregon. 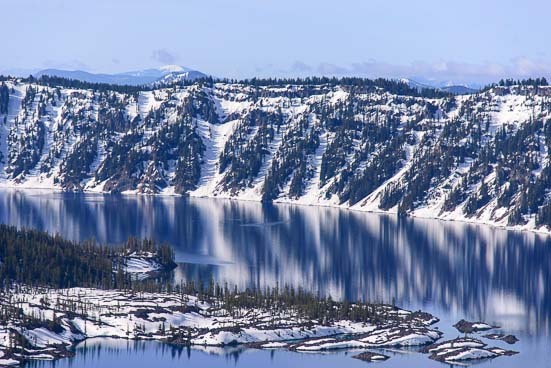 If you are interested in learning more about Crater Lake National Park, click here and here. 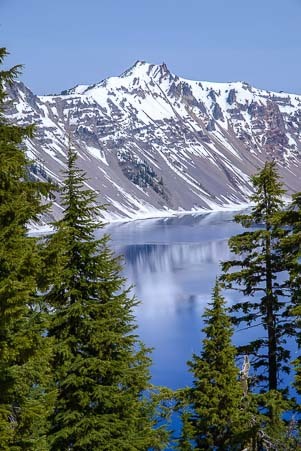 This entry was posted in Oregon and tagged National Parks US, New, Oregon, Snow, Travel, USA, WP Travel by Roads Less Traveled. Bookmark the permalink.